June always comes as a surprise each and every school year. In the beginning days of Fall, the year ahead seems endless. How can it suddenly come so rapidly to an end? For some of you school has come to an end, but for others, like in New York, there are still three more weeks of school. No matter where you are at this point of the year, it is always good to reflect and learn from your experiences. This week’s post considers some of the questions about charts we hear most often and hope our suggestions help not only now, but in the years ahead. The end of the school year is a great time to try out some new ideas and to find some new ways to deal with old problems. There are two problems we are asked about most often. One is what to do when the charts we have made are not being used by the children. Charts are excellent tools that teachers use in every subject to reinforce every teaching moment each and every day and it can be discouraging to not have them used. The second problem is what to do with all these charts? 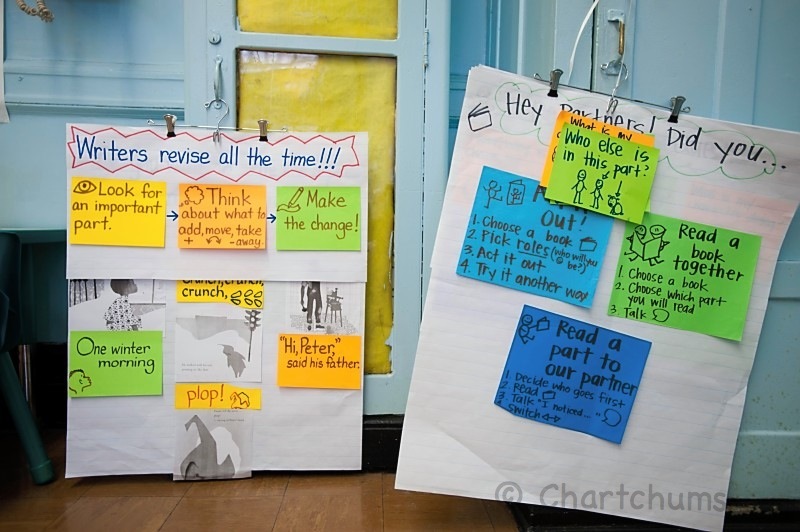 To answer these two questions we suggest three simple ways to deal with the charts in your classroom—what we call the 3 R’s of charting: reposition, revise, retire. This is often the simplest and quickest way to deal with bringing a chart back to life or finding space amid the chart clutter that can build up in a classroom. It is like rearranging the living room furniture— simply move a few things around and suddenly the entire room feels new again and you re-see things that had become invisible. Start by looking around at the charts in your classroom and choose a couple you really wish your kids would use more often. Is there a process chart that lays out the steps for accomplishing a strategy that kids keep asking you about instead of using the chart to remind them? Try moving it lower or closer. But don’t simply do this after school, have a discussion with your children. Start by explaining the problem. You might say, “Lately a lot of you have been asking for my help with how to punctuate dialogue when we have a chart that lays out the steps. This makes me think that maybe the chart is not in a good place and that maybe we need to move it to make it easier to find and use.” Then ask the children to look around and come up with possible places to move the chart that would make it more accessible. You might even try out a few of the kids’ suggestions and get a consensus of where the chart works best. The benefit of this process is that you hand over responsibility to the kids and invite them to find solutions to a class problem. These charts were hung on skirt hangers so they could be moved to positions more accessible in the classroom. Another way to make sure a chart stays new and used is to update the chart. There are several ways you can revise a chart to make it seem new and relevant again. One way is to revise the visuals. Perhaps the photos of the kids on the chart were taken a while ago and they have grown and changed since then. If this is a chart that is still needed, ask for volunteers to model the hoped for behaviors and photograph them in the act. Then make a big deal about how much they have grown—a kind of “look at us now” moment. 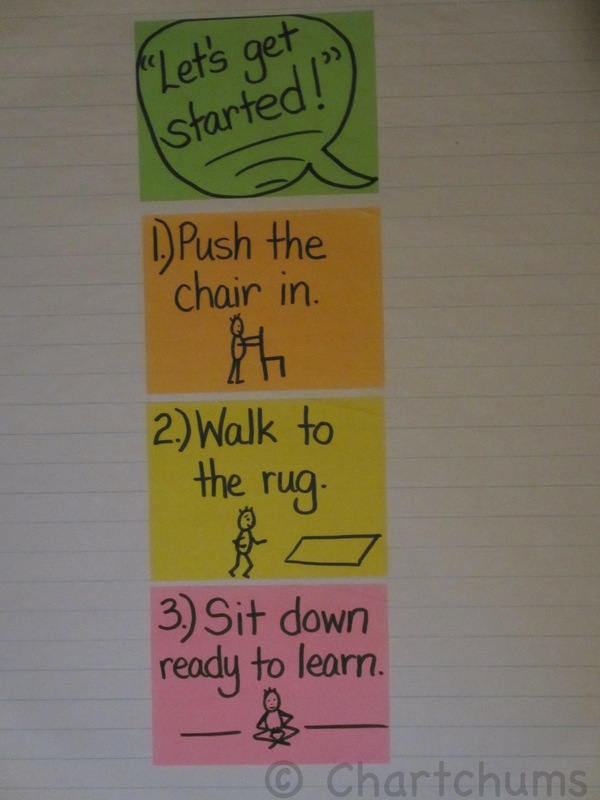 Or replace a clip art or drawn picture with a photograph of a child doing each step or strategy. Another powerful way to revise a chart is to remove strategies no longer needed. Again make a big deal about how hard everyone worked on this strategy, but now everyone is doing it without needing a reminder. You can also add new strategies to the chart that are more sophisticated so the chart grows with your children’s abilities. Another way to revise a chart is to change something like the wording or the mentor text examples. Perhaps the heading needs to be tweaked to match your current unit of study, so that instead of saying, “Ways to Elaborate Our Nonfiction Books” you revise it to say, “Ways to Elaborate Our Reviews.” Or change the mentor text examples to provide more relevant examples. Or maybe your class has come up with a new rally cry that is more catchy and says exactly what they are studying or hoping to accomplish. Again it is through discussion and debate that makes revising charts so powerful. The goal of revision is to reread and reflect on how to make something better and that is the goal when it comes to revising your charts—to make them even better. And what makes a chart the best is when your kids are using it again. This chart was revised by adding examples from a nonfiction text, “Lizards” by Nic Bishop. The third “R” is for retirement. A chart that has served its purpose well, but no longer matches your kids’ needs should be retired. Some telltale signs that a chart needs to be retired is it is faded or yellowing or you don’t even recognize the photos of your kids it is so old. But don’t just take it down after school and throw it into the back of your closet. Any retirement requires a celebration. Celebrate all the chart did to help everyone learn how to do something and how it helped them to grow. Have children prepare testimonials where they share out, “I used to use this chart to…, but now I….” Then bid the chart a fond farewell and put it in the closet, add it to a big book of chart, or send it down to a lower grade that might need it now. Ask anyone if they still feel they could still use the help of the chart and make small versions by photographing the chart so they can put it in their folder and refer to it as needed. Of course, you always have the option to bring a chart back out of retirement if it is ever needed again. A basic routine once mastered can be retired with a celebration. So take a moment and look around your classroom with your students at the charts that surround you all. Which charts are still important but seem to be forgotten? Reposition them. Which charts are still important, but just need some tweaking to fit a current unit of study? Revise them. Which charts are not longer needed? Have a retirement party. Every chart deserves its time in the sun, but you only have so much room, so always consider the need for the chart and the usefulness of the chart—the 3 R’s of charting will help you and your children make some important decisions about the charts in your room. PS: We have been busy putting the final touches on our new book, Smarter Charts for Math, Science, & Social Studies which will be out the end of August. We didn’t think it possible to top Smarter Charts, but the new book takes charting even further and makes charting even better. Stay tuned! After going through the blog, I feel that this information is really very useful in getting the knowledge about Digital advertising agency . Thanks a lot for sharing this vital information with us! !